Private property and construction firm St Hilliers is putting the finishing touches on the ACT's Common Ground housing project to provide much needed low cost housing for the ACT. 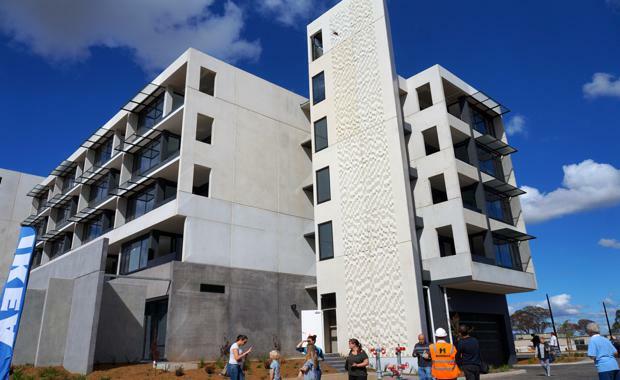 The state-of-the-art housing development on Gungahlin's The Valley Avenue is drawing on other similar overseas ventures in supporting people experiencing homelessness and other vulnerability in Canberra. Common Ground Canberra is the national capital's first low-cost supportive housing initiative focused on providing quality tenant outcomes for people who have experienced chronic homelessness. There are 20 one-bedroom units available as emergency accommodation and a further 20 units available as affordable longer-term rental accommodation. A ground floor common area will include a large kitchen and living areas, computers, entertainment and administration facilities. An outside BBQ area and eating space is complemented by a community garden and other facilities. Each unit includes larger than average areas, 6-star rating construction features and appliances. A successful Open Day was held on April 11, which was attended by over 400 people who were able to inspect the facilities and surrounds and see first hand the amazing work being done by the ACT community. St Hilliers Executive Chairman Tim Casey said the company was proud to be associated with this ground breaking project based on successful similar models first developed in New York. "There is a need for more accommodation like this especially for those that have been continuously homeless for an extended period of time," Mr Casey said. "We are proud to be the builder for Common Ground Canberra and thank all our subcontractors and other businesses for their generous support and donations. "The project has been backed jointly by funding from the Federal and ACT Governments and is due to be officially opened in July. St Hilliers Project Manager Maurice Flynn said that over 110 staff and contractors were working on Common Ground Canberra at its peak.